We are in full swing fundraising for a new giant laser cutter! At the time of writing, we are 3 weeks in and 25% of the way to our goal of $10,000! A huge thanks from us to everybody who has contributed!!! This laser cutter has a working area of 48″ x 36, which can be used for both large-scale projects and increased output of smaller projects! Check out the Generosity link for more information. From Jeff: Our Tool area is also undergoing improvements! Thanks to labor put in by some of our members, the Tool Area of the shop has undergone a great transformation, and will soon offer a new layout, with improved organization for access to tools, including the CNC Table, Metal and Wood Lathes, Drill Press, Routers, Drills, and Articulating Arm Saw. Tyler Crumpton loves arcade cabinets! He designed his first table-top cabinet last year after retrofitting the full-size cabinet in the shop with a new monitor and accessories. 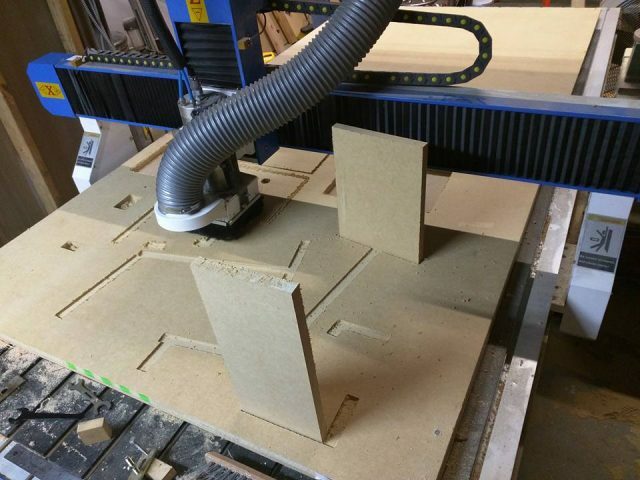 He cut and assembled revision #1 of his bar-top arcade cabinet at Makers Local 256 this month! 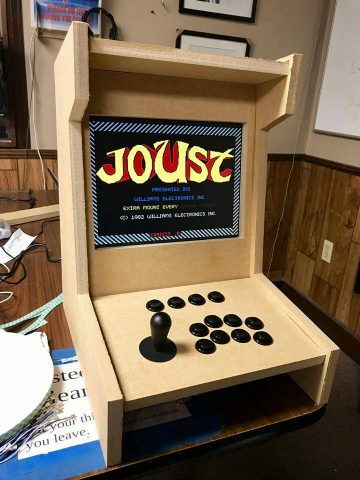 It was CNC-cut from 3/4″ MDF, built with a 15″ Dell flat-panel 4:3 monitor, and uses Happ buttons and joystick. Final steps for this project will be sanding, painting, and T-molding! Here are some cool facts about ML256! The shop’s roots started over a decade ago! In October 2006, the first meeting was held, and in 2008, this group of makers moved into the first physical space (shop 1.0)! Currently, we are in our third home, shop 3.0. We have over 80 members! At the moment, we gain approximately one new member per month! Our members are diverse – from teenagers to golden-agers, biologists to engineers, women to men (and sometimes dogs and cats!) – we have a wide range of ages, genders, and interests represented in our membership! Our space has some secret upgrades – the USB door lock and RFID change machine (CasCADE) are occasionally overlooked by first-time visitors, but are well-loved by frequent flyers! Previous Post: Featured Maker: Tyler Crumpton! Next Post: Featured Maker – Tim Heath!